While a graduate student Randall Burkett started collecting books to support his research on Marcus Garvey and on African American religious history. Over the years his collection expanded to include books, pamphlets, prints, newspapers, and ephemera related to African American life and culture. He has exhibited selections from his personal collection at Harvard University’s Widener Library, the Grolier Club in New York City, and elsewhere. Since 1997, Burkett has been responsible for building Emory University’s collection of African American rare books, manuscripts, photographs, and print ephemera, and he has raised nearly three quarters of a million dollars to endow acquisition and fellowship funds for the Stuart A. Rose Manuscript, Archives, and Rare Book Library. 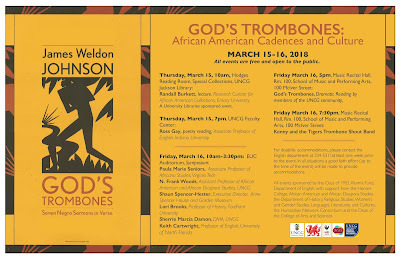 This lecture is part of the God's Trombones: African American Cadences and Culture symposium being held at UNCG March 15-16, 2018.